What are some of the top things we learned for fantasy football in Week 12 of the 2018 NFL season? Fantasy football is an ever-changing game, and what we thought was a sure thing a few weeks among might not ring true anymore. Below are seven things we learned from Week 12 of the 2018 fantasy football season. McCaffrey dropped 125 rushing yards and 112 receiving yards — and two total touchdowns — on the Seahawks Sunday. His 17 rushing attempts were tied for his second-most on the season, and coupled with 11 receptions, McCaffrey had nearly 30 total touches. 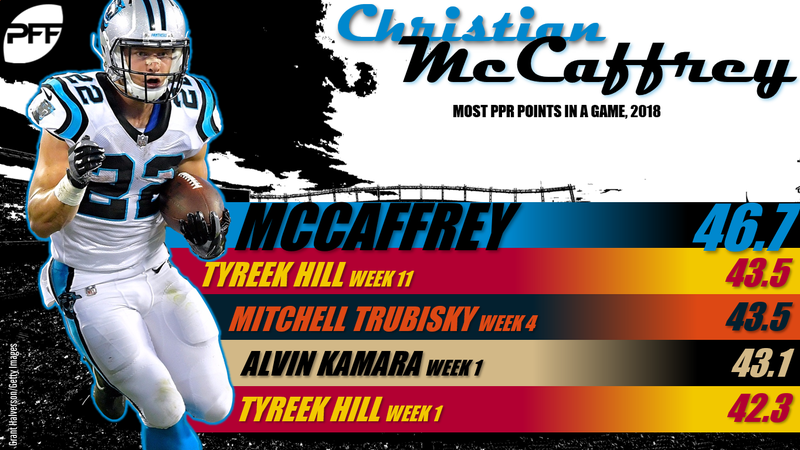 McCaffrey exploded for 46.7 PPR points and reminded us all of how all-around good he is at football. Dual-threat running backs are the cream of the crop in fantasy, and McCaffrey is one of the best. Chubb pounded the rock 28 times in Week 12 and he added three receptions for 44 yards and a score as well. Chubb now has over 20 rushing attempts in three straight games (and five straight games with over 18 attempts). He’s locked in as Cleveland’s goal-line back and has a rushing touchdown in three straight games. He also has over 80 yards and a score in four of his last five. Adams has been working his way up the Philadelphia depth chart, and he reached the peak in Week 12 with 22 rushing attempts for 84 yards and a score. He sees inconsistent work through the air (just one target this week), which prevents him from earning RB2 consideration, but he’s earned flex consideration for the rest of the season. Adams now has over 50 rushing yards in three of his last four with a rushing touchdown in two straight. Lockett scored six touchdowns over his first seven games, but he had more than five receptions in just two of those. Lockett now has three straight games with five receptions (including touchdowns in two of the three), and he seems to be getting better. His 107 receiving yards in Week 12 were his most this season, and his 21.5 PPR fantasy points were also a season-best (his previous season-best was 19.5, set in Week 10). Gronk didn’t have a monster final stat line — he posted 3-56-1 on the Jets — but his usage was fantastic. Gronk scored on a deep shot down the middle, and he had three other end-zone targets in Week 12. With four end-zone targets in a single game, it’s clear that the Patriots are keen on getting Gronkowski more involved in scoring situations. That’s great news for fantasy owners down the stretch. Kittle had 6-48-0 (with one rush for 10 yards as well), which, overall, was one of his worst games of the season. But hidden in that stat line is the fact that Kittle had an insane 12 targets, which is a number usually achieved only by the likes of Zach Ertz, Travis Kelce, and Gronkowski. Quarterback play might be holding Kittle back from that group, but he’s on the fringe. Don’t look now, but Mayfield now has multiple passing touchdowns in five straight games. In that span, he has thrown 13 touchdowns and just two interceptions while averaging 233 yards per game. 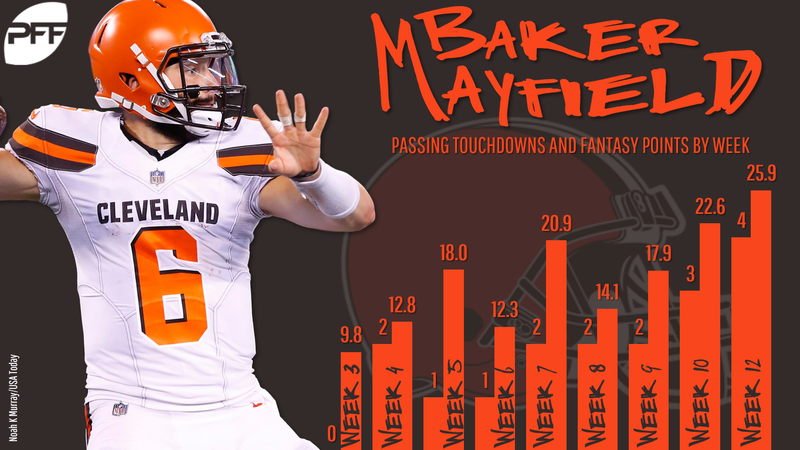 Mayfield had his best game yet in Week 12, torching former head coach (and current Bengals defensive coach) Hue Jackson’s defense for 258 passing yards and four scores — and a lot of that damage came in the first half. Mayfield faces this same Bengals defense in the fantasy championship (Week 16).